After breakfast in Decorah we headed for Stockholm, Wisconsin to visit Gaylord and Brenda Schanilec. Gaylord is a wood engraver, letterpress printer, maple syrup maker, and fisherman who's books draw their unique power from a close examination of his natural surroundings, a method Brenda refers to as playful science. In two of Gaylord's recent books, Mayflies of the Driftless Region and Sylvæ, he has treated the observation of the mayflies he uses for fly fishing or the trees on his property as his starting point, and allowed the content of the book to grow and gather around his findings. 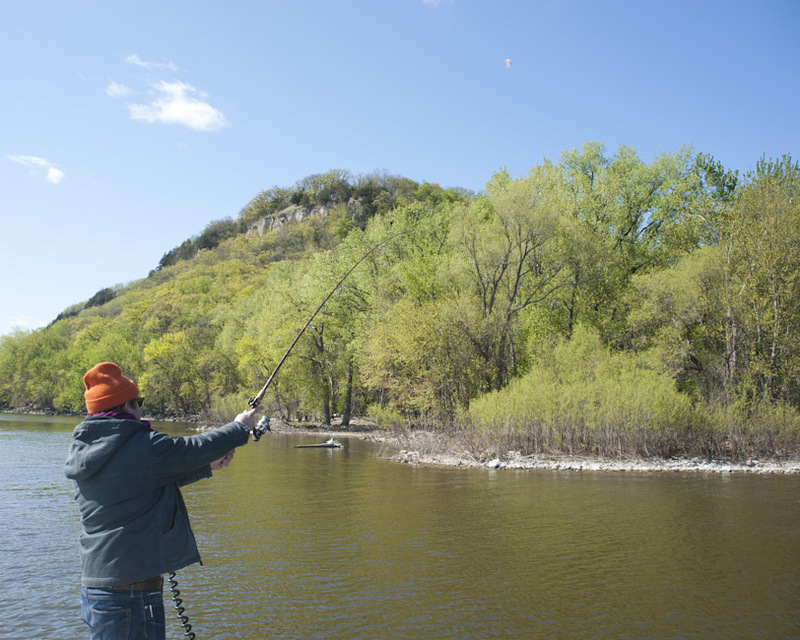 For his current multi-volume work titled The River he is engraving specimens of fish and mussels that he catches in Lake Pepin, a natural swelling of the Mississippi River near his home in Stockholm. For this purpose he has outfitted a motor boat with an observation tank, a drawing table, a small library, and a cabinet for his camera equipment. His goal is to eventually catch every species in the lake. 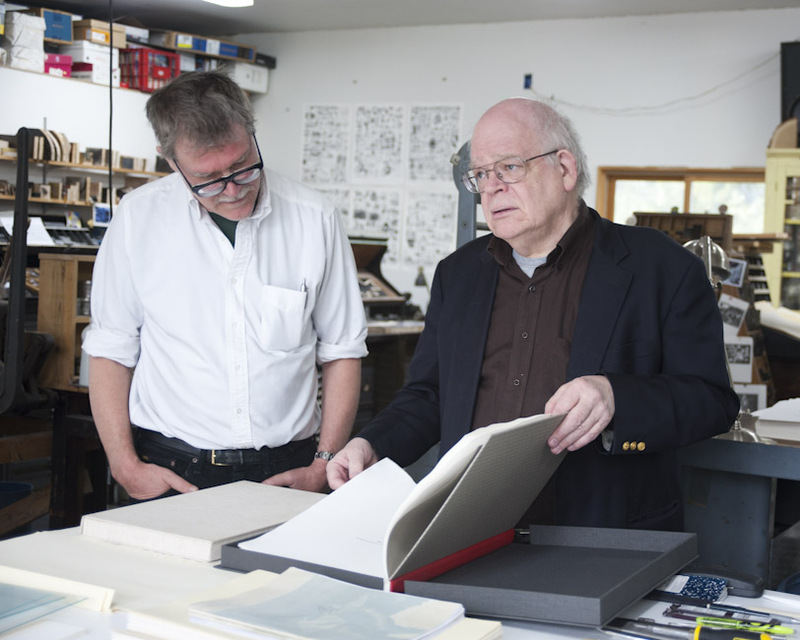 As he collects, records, and engraves specimens for the first volume, he simultaneously collects historical narratives about Lake Pepin. 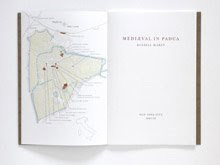 The various passages he gleans from these narratives will form the text of the book. Although our work is very different, I feel a great affinity for Gaylord's process—Sylvæ made me first consider appending notes to my alphabetical works. Gaylord can engrave on wood with more delicacy than I can draw with ink and this entire trip grew out of my desire to take an engraving lesson with him. 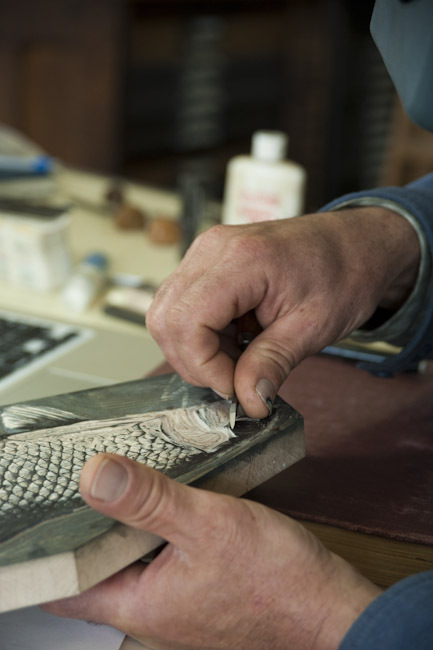 When I first brought the idea up he said, "I can show you how to use the tools but I can't imagine you'll want to invest the time to become an engraver." While it is true that I am not interested in making traditional wood engravings using what Gaylord calls the "flurry of lines" technique, I am interested in involving more autographic processes in my work. 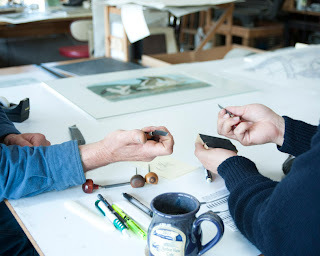 As long as I know one of the greatest living wood engravers, I might as well learn to use the tools from him. The engraving lesson, though, was only part of the draw to visit Stockholm. Every year or two Gaylord comes for a visit to stay with us in New York and I have come to regard him in an urban setting. 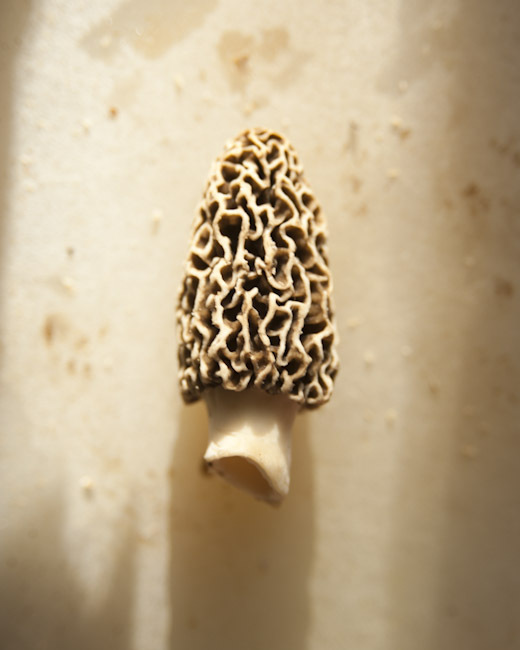 He talks about cutting down trees or catching mayflies but his stories remain abstract. I have never seen him in his native surroundings. His description of his property as being two miles from a town of 80 people is not something I can easily visualize. 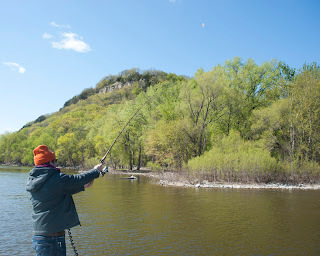 Similarly, when Gaylord began work on the River project I told him that I used to do a lot of fishing when I was a kid. I don't think he believed me. Our knowledge of each other was limited by urban settings—it was time for a visit. Winding our way north through Iowa, both Annie and my cell phones lost reception at the Minnesota border (perhaps that's what they mean by "driftless region"). Gaylord had suggested driving up the river on the Minnesota side and then crossing into Wisconsin at Wabasha or Winona. Shortly after merging onto routes 14 & 61 in La Crescent, Annie pointed out the passenger window and said "That's a really big bird." I turned my head to see an enormous bald eagle keeping pace with us. Somewhere just north of La Crescent we had crossed the less clearly marked border into Oz. My excitement at seeing a bald eagle in flight was soon tempered when I noticed that they were everywhere—sitting in trees, circling high above, criss crossing their feeding trough, the Mississippi. After the fourth or fifth eagle sighting I had become jaded enough to wonder if the bald eagle is to the Minnesotan what the pigeon is to the New Yorker. With an hour or two to spare before we were scheduled to arrive in Stockholm, Annie and I decided to lunch and take in the sights of Wabasha, Minnesota. Entering the town limits we learned that Wabasha was the location of the film Grumpy Old Men, suggesting that the iconic scenes of ice fishing from said movie may have been filmed on what I had thought of as Gaylord's lake. 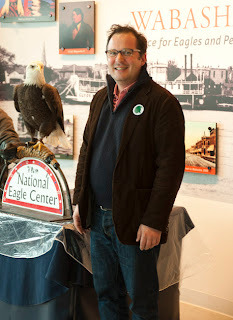 Prior to arriving, Annie had queried the town on her iPhone and discovered that, in addition to our various dining options, Wabasha was home to the National Eagle Center, a sight not to be missed. After a delightful lunch of grilled cheese, salad, and Cheesy Chicken Tortilla Soup at Stacy's Kitchen, we trudged through the rain to the Eagle Center. I had assumed the Center would consist of a series of dramatic dioramas, patriotic soundtracks along the lines of "American by birth, Harley rider by choice", and some pay-as-you-go binoculars, but the first thing I saw on entering the Center was a young woman with a gigantic eagle perched on her hand. I suppose I should have been excited but my first impulse was to flee. In a contest of strength or will, I would surely be defeated by such a bird. Is it even legal to keep a bald eagle captive? I steeled myself, paid the $16 entry fee for two and cast myself into the fray. The picture below will give you a good idea of what I look like when I think my eyeball is about to be plucked out by a huge, predatory bird. Quitting Wabasha, we crossed over into Wisconsin. The river bridge eases into a causeway on the Wisconsin side and travels through a diverse wetland, with shaded eddies, tall grasses, and verdant trees arched above secret pools. Just like my experience in Iowa, I didn't know what to expect but my expectations were wrong. When we hit solid land in Nelson we paid "Smiling Bob" a visit at the discount liquor store and picked up a bottle each of Santa Margherita Chianti and Knob Creek bourbon as house gifts. At the checkout counter I noticed a bottle of maraschino cherry-colored liquor called "Ice Hole" with a surprisingly moderne label. We chose not to sample it but I bet it has kept a lot of solitary ice fishermen company in their shacks. 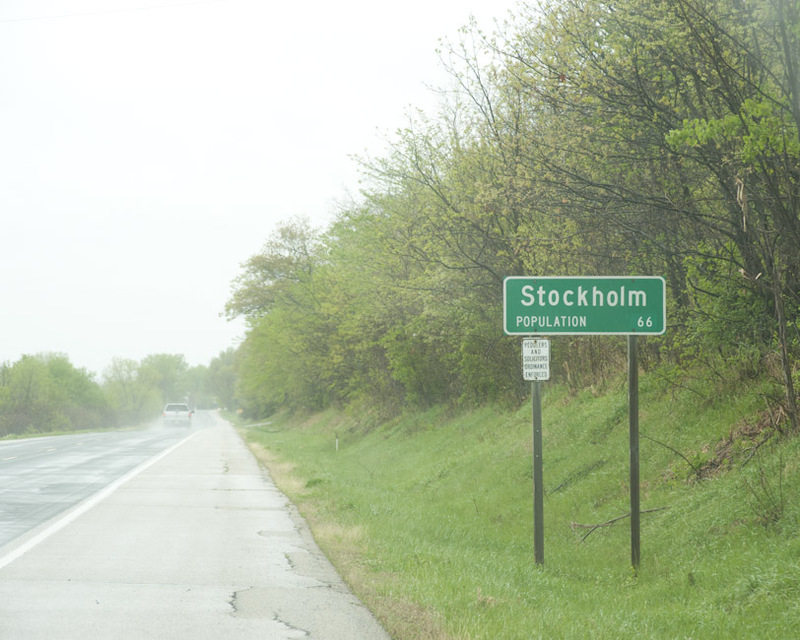 After a bit of a drive, we passed by the designated turn off at County Road JJ in favor of touring through the town of Stockholm. To our surprise, the town sign listed the population at 66 rather than the oft-remarked 80. Gaylord and Brenda's land is perfect for an artist in the same way that it is probably all wrong for a farmer. Their house and out buildings are perched on the peak of a hill from which their property falls away into a ravine. There is just enough flat land for the four buildings, a kitchen garden, a small orchard, and a regulation tennis court. Grading downward in all directions are their woods. 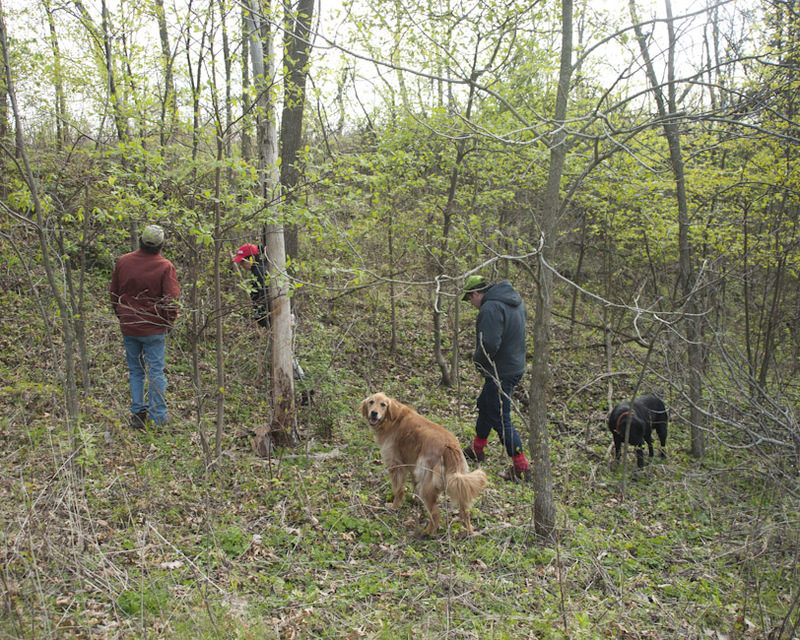 In addition to being the source of his book Sylvæ, the woods are where Gaylord taps his syrup trees (a distant cousin of the money tree) and where he and Brenda go morel hunting in the spring. Prior to arrival, Gaylord made it clear that a morel hunt was in the offing. 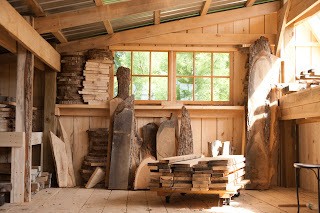 Of the four buildings on their property, one houses a printshop, one a wood working shop, and one exists solely to store and kiln-dry wood. Gaylord's printshop is roughly six times the size of mine and, as is true for all printshops, it is just a little too small to fit that one last piece of equipment. The next morning we set to work. I'm a little embarrassed to say that I had never seen someone engrave in wood before our lesson. In all of our conversations about engraving, Gaylord has been insistent that he can only teach me how to hold the tools, the rest is practice. What I found most informative about the lesson, though, was watching the pace with which Gaylord works with those tools. I have always imagined that the fine white lines of wood engravings are made with a continuous, fluid movement, making the precision with which people like Gaylord engrave seem otherworldly, or at least unattainable. 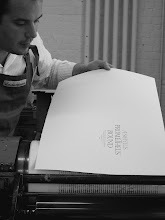 Instead, the process is extremely slow and measured, each line engraved one tiny bit at a time. In many ways the pace reminded me of complex vector drawing on the computer, though of course with very different results. Every time I began to cut I had to check myself to slow down. After thirty minutes of messing around, Gaylord showed me how to shorten the gravers to the correct length, packed up a selection of his homemade wood blocks for me to practice on, and began getting the boat ready. 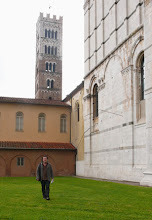 The lessons I will be taking on this trip will be concise sessions that I will follow up in correspondence. Since returning to New York I have begun engraving a block and as I progress I will proof it and send prints to Gaylord for comment. Gaylord showing me how to hold the graver. Master and student at work. Next we set out for Lake Pepin for an expedition on the boat. 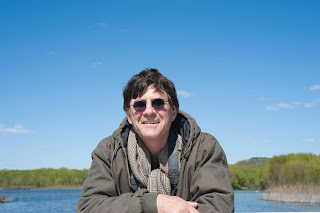 Since Gaylord began work on The River I have been hearing certain names recur—Lake of Tears, Point au Sable, and Point No Point—names that seem more likely to pepper the notebooks of Meriwether Lewis than the blog of a friend of mine. Point No Point has been a particular curiosity to me. It is such a graceless name that I cringe every time I hear it, making me want to see it all the more. True to form, it was fascinating, the only true geological tropme l'oeil I have ever seen. Motoring north up the lake after a brief mussel hunting excursion on Point au Sable, Point No Point came into view and remained, without ever changing shape, as we progressed up river. The point never came to a point but always looked like one. Until, suddenly, we crossed the perspectival barrier that revealed the point for the gentle bend that it is. 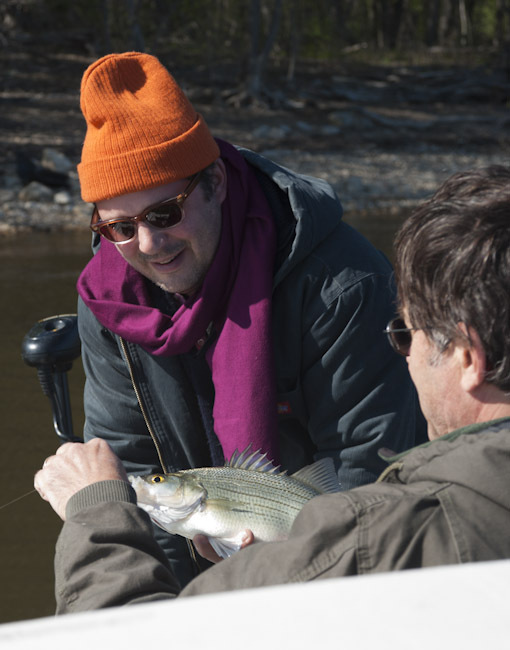 Crossing the lake to the Wisconsin shore, Gaylord set me up with rod and reel and nearly fell off the boat with disbelief when I actually caught a fish: an enormous white bass that is sure to be a record breaker. Un-hooking the record-breaking bass prior to release. The next day it was time for the hunt. 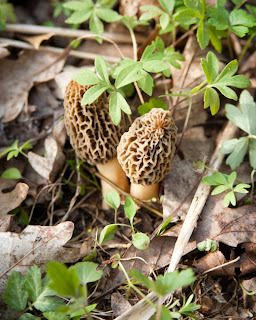 Brenda had made fresh morels for dinner on both nights of our visit thus far and the stocks were getting low. I have never met a serious book person who does not also love food and there are few more appropriate activities for printers to engage in (when not printing, of course) than to hunt for food. In fact, for many printers it seems that printing is what one does to fill in time between eating. 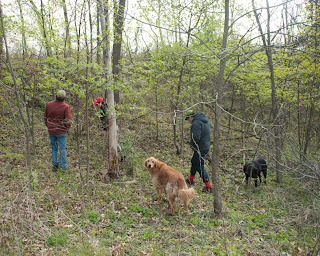 After tooling around the shop all morning, Gaylord, Brenda, Annie, the two dogs, and I packed off to hunt the elusive mushrooms. To cap our visit off, Terry Belanger, Director Emeritus of Rare Book School, and Dan DeSimone, Rosenwald Curator at Library of Congress, just happen to be visiting the bookseller (and Gaylord Schanilec bibliographer) Rob Rulon-Miller in St. Paul. 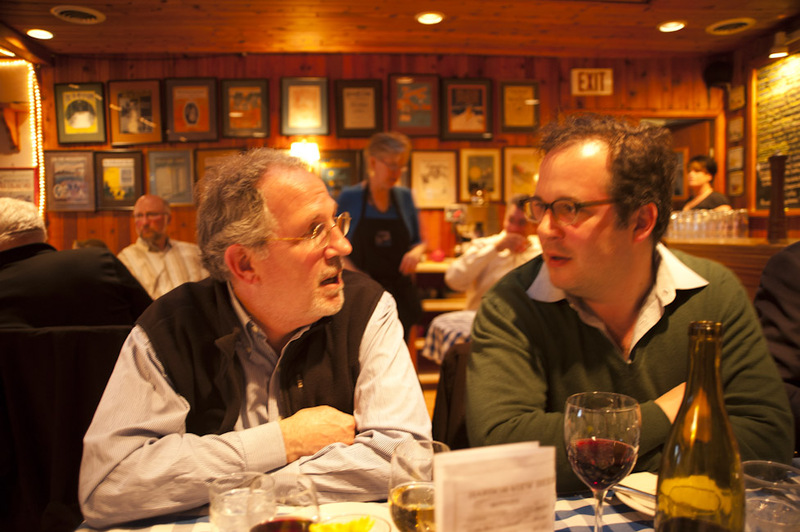 They drove down for a studio visit and to join us for dinner at Pepin, Wisconsin's world famous Harbor View Restaurant. After a sizable and delicious serving of food, Annie and I turned in to bed for our last night in Stockholm. 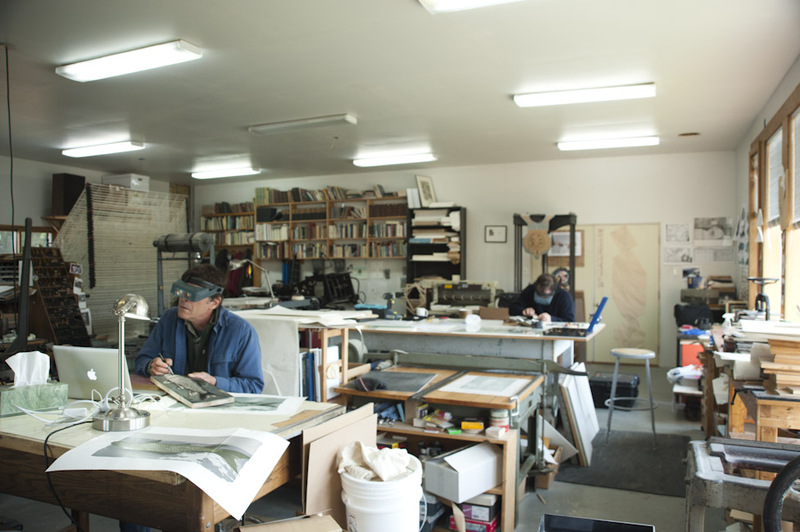 Rob Rulon-Miller and Terry Belanger looking at books in Gaylord's printshop. 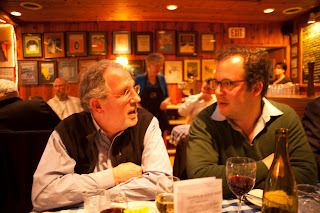 Dan DeSimone and I deep in conversation.